The story is true. The pictures are real. The rest is iffy. The Amazon: it’s a jungle out there, every living thing struggling for a niche. That’s why they call it the jungle. Impersonation is a rainforest survival technique and the types of foolery have been well documented, except for one. It is with the simplest evidence and humblest mind (or vice versa) that I hereby extend the model and offer a new type of imitation: malicious mimicry ©. Imagine a species that deliberately resembles another with the express desire to inflict emotional damage. In 1878, Fritz Müller described species that possessed similar deterrents (say being poisonous, sticky, smelly or socially deviant) come up with a common appearance for the sake of efficiency. It’s a whole lot easier to teach predators one signal than to confuse them with multiple duds. 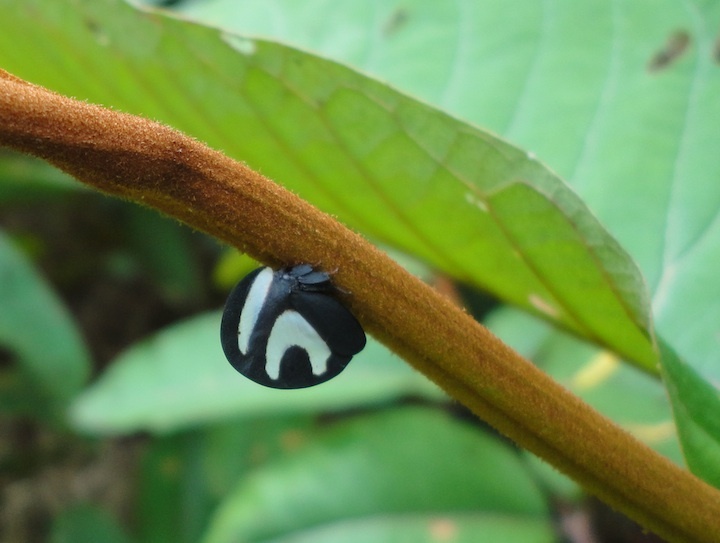 One can easily imagine focus groups of poison dart frogs designing their logo. A little earlier and in the same part of the world, Henry Walter Bates described how some innocuous critters could scam the system by posing as others who had actually gone through the evolutionary pain of acquiring noxious qualities. The case for malicious mimicry © starts with the beautifully written and illustrated children’s book by Lynne Cherry, The Great Kapok Tree. It’s a recast of the 1837 Woodman, Spare that Tree, with the protagonists played by the forest animals whispering subliminal messages into the axman’s ear. Kapok, scientifically, Ceiba pentandra, is a large tree native to tropical America and parts of Africa. The Mayans believed that the great tree stood at the center of the Earth. It can grow to an enormous size and is home to dozens of animals and hundreds of plants. 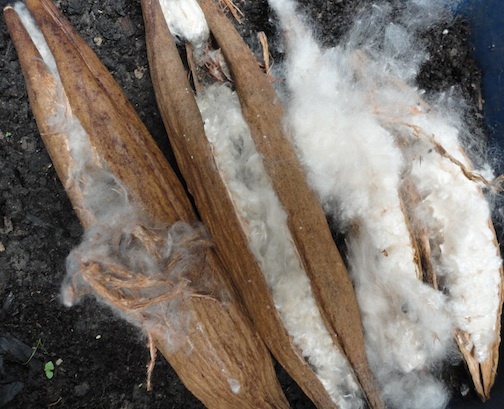 The fiber is used from everything from filling stuffed toys to wrapping blowgun darts for hunting. 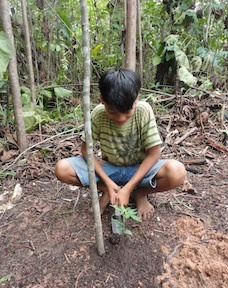 The plan went this way: take the passion for rainforest preservation and reforestation to the children. Hook up with the classrooms that read this great book and tap the youngsters’ enthusiasm. I’d supply the sapling and a needy place in the Amazon to plant it, and for the cost of getting it into the ground, make up a nice picture suitable for framing. The first challenge is that the tree produces seeds only sporadically – after a drought, it drops its leaves and puts out nocturnal flowers pollinated by bats. In August 2011, I stumbled upon the mother lode of kapok seed pods. I cleaned them, stuffed handfuls of fiber into a travel pillow, (prepared a story for the mattress police at customs just in case), then set out to see if I could get the things to grow. 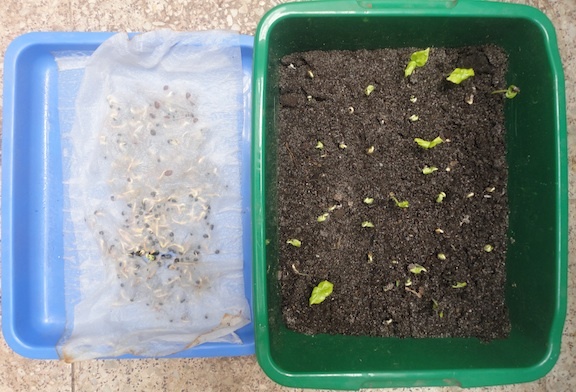 The pea-sized, black seeds immediately responded to surrogate soil (wet paper towels) and within a week they were ready to transplant to plastic bags. I left them in good hands and went back to the States to start a new school year. Upon returning four months later on holiday break, I was horrified to find that nosy neighbors had caused the plants to go into hiding – booted off one property and obscured from view on another. 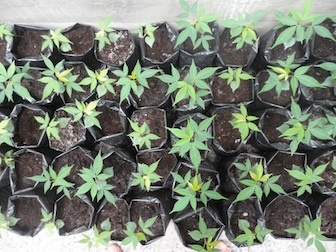 Seems that to the casual observer, the young plants resemble a rather recreational weed, so to speak. Clearly, there is no purpose in this similarity except to cause me emotional damage and derail the project. Malicious mimicry © – like twins dressing up in the same outfit looking for mischief. You heard it here first. These are not weeds. This is not weed. So, now I’m left with good intentions and a hundred wonderful kapok children. 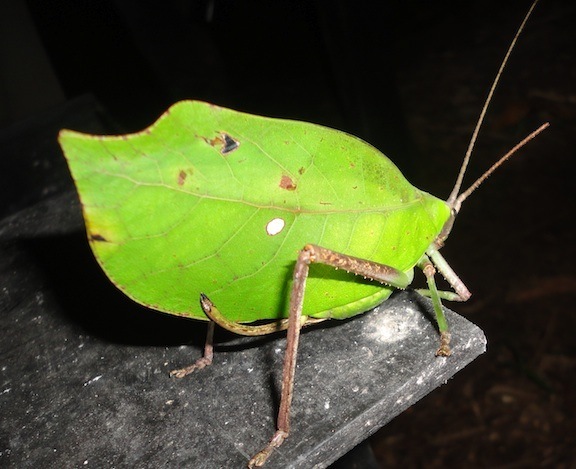 Nonetheless, they will find a home and be a home in the rainforest. Please check back again in ninety years. Pictures taken in Loreto Perú.